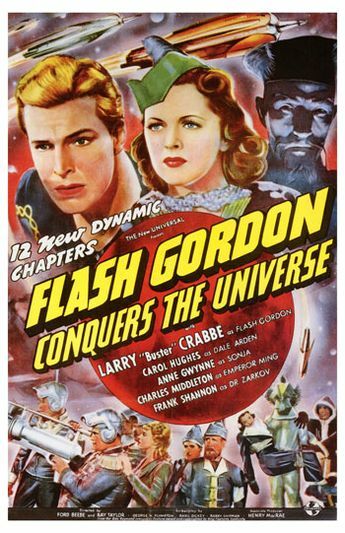 Flash Gordon Conquers the Universe is a 1940 American twelve chapter black-and-white science fiction serial film from Universal Pictures, produced by Henry MacRae, directed by Ford Beebe and Ray Taylor, that stars Buster Crabbe, Carol Hughes, Charles B. Middleton, Frank Shannon, and Roland Drew. The serial was written by George H. Plympton, Basil Dickey, and Barry Shipman and was adapted from Alex Raymond’s syndicated newspaper comic strip of the same name. It was the last of the three Universal Flash Gordon serials made between 1936 and 1940. During the 1950s, all three of these Flash Gordon serials were directly syndicated to television by Motion Pictures for Television, along with many of Universal’s other serial output. To avoid confusion with the Flash Gordon TV series airing around the same time, they were retitled Space Soldiers, Space Soldiers’ Trip to Mars, and Space Soldiers Conquer the Universe. In 1966 Flash Gordon Conquers the Universe was edited down into two feature-length films for television syndication, Purple Death from Outer Space and Perils from the Planet Mongo, by King Features Syndicate. In the early 1970s, a third feature version was re-edited for the 16mm home movie market, using story material from the entire serial. It bore the title Space Soldiers Conquer the Universe and later appeared on television during the 1980s. Afterward, all three edited feature length versions became available through various public-domain video sellers, first on VHS videotape and later on DVD. In the mid-1970s all three complete Universal Flash Gordon serials were shown chapter-by-chapter by PBS stations across the US, bringing them to a new generation of science fiction fans, two years before Star Wars and Close Encounters of the Third Kind. From the late 1980s onward, all three serials became available on the home video market under their original theatrical release titles, chapters, and running times.